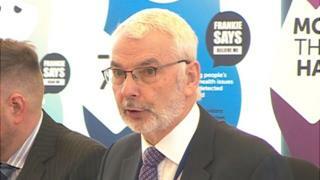 Image caption Michael Lane told charities that opposition to his budget would have "far reaching implications for much-needed services"
Victim support and crime prevention charities have raised fears about their finances after being caught in a row over Hampshire's police budget. Conservative Police and Crime Commissioner (PCC) Michael Lane warned of a funding delay after the police and crime panel "ambushed" his budget. Members of the panel called his letter to charities "petulant". Age UK Isle of Wight said it could affect its project aimed at reducing hate crime. At a meeting in January Hampshire Police and Crime Panel - made up of councillors and representatives who scrutinise the work of the PCC - raised concerns that an extra £440,000 was earmarked for the PCC's office at a time when up to 160 police and support staff could be cut. It voted to only allow money to be used for "services directly provided by police officers and staff". Mr Lane's office subsequently wrote to charities saying the decision had "created a delay" in spending from the Safer Communities Fund which would have "far reaching implications for much-needed services". The letter said there would be a "fresh review to establish what funds will be available and which services he can continue to support if the funding available for grants investment is reduced by 40% that would then be required". Nicola Attfield, from Age UK said a delay in funding for its project involving the Isle of Wight's LGBT community could lead to a staff member losing their job. "We do a lot of work to reduce hate crime and if the project stops we may see an increase in hate crime. "That would mean more work going to the police." Bob Purkiss, an independent member of the panel, said: "It seemed to be a petulant response. The money the PCC gives out to charities is totally separate from that which he asked additional funding for. That is not the additional money he was seeking." Mr Lane said his office costs were currently "the lowest in the land". He said the budget showed an extra £440,000 allocated to the PCC but the increase included £280,000 which was previously taken from police force reserves.